This new hotel in the north of London was a 2-storey addition to an existing 7-storey concrete car park building. Construction started in September 2016 with erection being completed using a spider crane situated on the 7th floor. 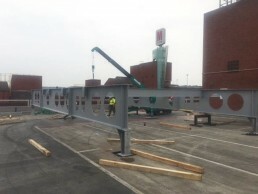 This single level of steelwork consisted of 1200mm deep cellular beams which had been designed to support a further 2-storeys of modular units.